150 years of the King’s Lynn to Hunstanton Railway. Henry was a 19th century gentleman, a polymath with many varied interests. One of his finest achievements was the railway line which ran through Wolferton, so useful to residents and holidaymakers as well as members of the Royal family. 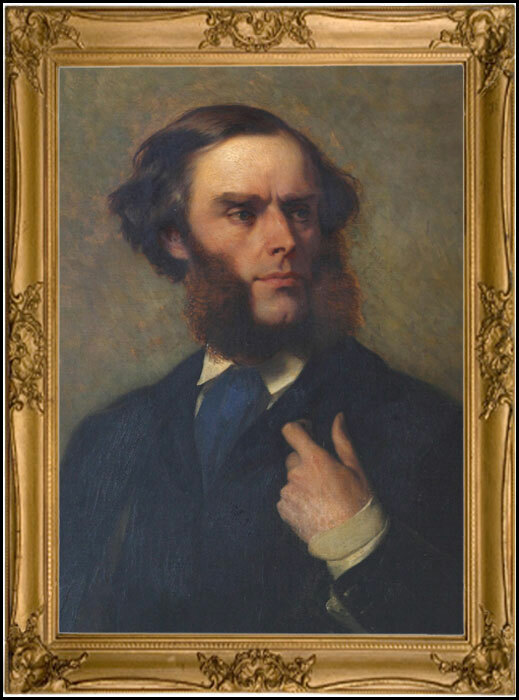 Born in Snettisham Old Hall in 1815, Henry was a descendant of a marriage alliance between the Stylemans, a prosperous Norfolk farming dynasty and the L’Estrange family, established in Norfolk in the reign of William the Conqueror. He was heir to 10,000 acres of Northwest Norfolk, the estate stretching from the western edge of Holme through the whole of Hunstanton and Snettisham as far as Wolferton creek, including parts of Heacham and Sedgeford. Sadly, when he was just four years old his father died. Henry inherited his estate when he was 21 and a few years later, in 1839, he married, taking his new bride to live at Hunstanton Hall where he assumed a serious role as Lord of the Manor. An active and caring landlord, he improved farming methods, restored cottages, built schools and re-roofed and refurbished St Mary’s church. He was also a great family man and spent much time and effort converting Hunstanton Hall into an impressive home for his wife and six children. His reputation as a creative artist spread throughout England, his advice being sought on the design and decoration of several churches. His greatest artistic achievement was the design of the ceiling of the cathedral at Ely. He employed assistants for some of the work but spent much time himself lying on planks painting the wonderful designs which can still be seen and admired today. In Norfolk his greatest legacy was the town of Hunstanton. He began to plan as early as 1840 a sizable seaside town on the coast next to the village of Hunstanton, but it was slow to grow. Access was difficult, the only approach up a steep chalk incline, needing extra horses to bring people and goods to the town. Then Henry had the idea that the railway, with its potential for cheap travel, could be useful to his new town. Once he and his family could actually travel from King’s Lynn to London by rail, he began to lobby to extend the line from King’s Lynn to Hunstanton. 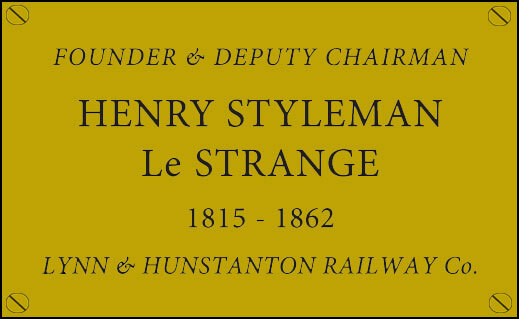 The Lynn and Hunstanton Railway was incorporated in 1861 and Henry became a director. Entries in his diary record how he had to ‘argue with the railway company’ but in the end he won and the line was completed. He gave much of his own land free of charge for the line and for wayside halts and persuaded other landowners along the route to do the same. He employed the engineer, J.S.Valentine, to build a station at Hunstanton which opened in July 1862. As he forecast, people soon learnt the value of the train and New Hunstanton became a great success although Henry did not live to see it. In the same week as the opening of Hunstanton station he died from a heart attack. The information above is taken from the book ‘A Fine Strong Boy’, written and published by Kath Fryer in 2000. With the sequel ‘Henry’s Children’ published in 2002 which continued the story of the family of Henry le Strange. These books are now out of print but copies may still be found. Copyright © 2019 Wolferton Station. All rights reserved.